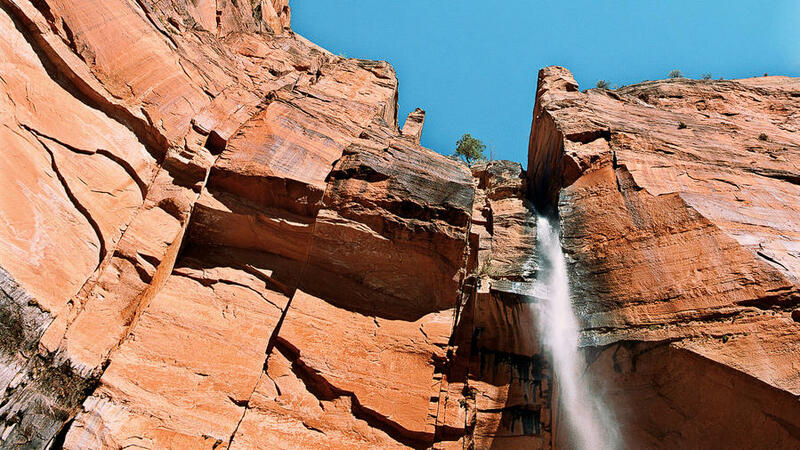 Upper Emerald Falls is a white plume against Zion's red rock. In the fading light of a stormy afternoon, a waterfall plunges hundreds of feet down sheer sandstone walls in the upper reaches of Zion Canyon. There’s a burst of red, followed by several more. Lightning flashes through the canyon, illuminating the rich colors of the narrow amphitheater known as the Temple of Sinawava. Thunder rolls in long and low, bouncing from the canyon floor up through my boots ― from sole to soul in an instant. “Awesome,” I say aloud. That is a word I try to avoid, but in this case it happens to be perfect. Earlier in the day, the waterfall wasn’t here. It came to life only after the first storm in four months rumbled into this southwest Utah national park. My friend Tom and I had arrived in Zion during its off-season hoping for this kind of moment, the chance to experience a classic national park under its best conditions. And free of crowds. No offense to the two million or so peak-season visitors (or, for that matter, Tom, who waits in the truck), but at Zion, the fewer the witnesses, the easier it is to bear witness. As we drive down Zion Canyon, the Virgin River is running high, tumbling over boulders and rushing through forests of bare cottonwoods. We’re the last ones on the road and we’ve barely seen anyone all day. No doubt the rains kept people away, but even on our first day in the park, a glorious one with big scattered clouds casting fast-moving shadows across the red rock, the park was comparatively empty. 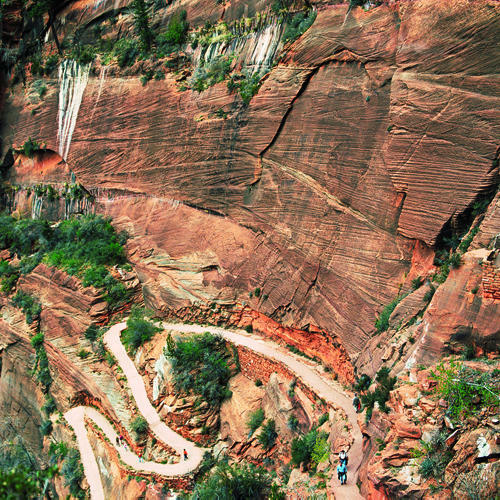 We also have the flexibility to explore Zion Canyon in a way that is impossible seven months of the year. From April through October, private cars are prohibited in the canyon, and visitors must use park shuttles. With 11,000 daily visitors, it’s hard to dispute the need for such restrictions. Or their importance to the Zion environment. (“Since the shuttles started, there have been 30 species of birds seen that hadn’t been observed here in four or five decades,” says Michael Plyler, a photographer and director of the Zion Canyon Field Institute.) Still, it’s nice to be on our own. Springdale is the main gateway to Zion. Unlike most towns on the edge of a national park, it’s more than just a way station for picking up ice or gassing up. 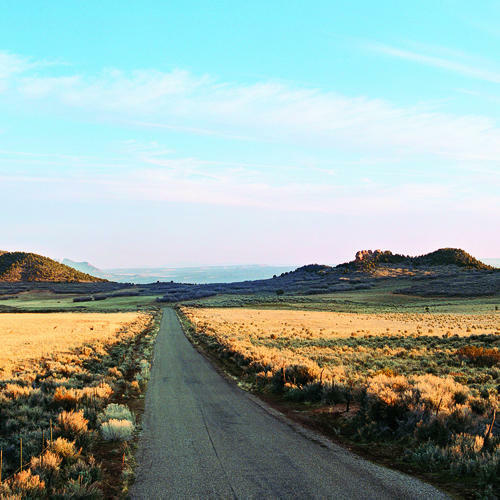 While nearby St. George is one of the country’s fastest-growing cities, in Spring-dale there are no traffic lights or fast-food franchises. But there are acupuncturists, artists, and yoga teachers. Population 650, it mixes the descendants of pioneering Mormon families with more recent arrivals, drawn here by the opportunity to live amidst Zion’s glories. Natives of England, Deb Durban and her husband, Steve Masefield, own Under the Eaves Bed & Breakfast. The 1930 house, built from local red sandstone, has its traditional elements. That said, Durban and Masefield are the antithesis of fussy innkeepers: She’s an artist and he’s a onetime computer security specialist with a decidedly irreverent sense of humor. At Zion, the path to enlightenment is an uphill climb: Its grandeur and scale are only truly revealed by ascending its mesas. We head toward Angels Landing and along the West Rim Trail to Horse Pasture Plateau. Seen from the canyon, the mesas’ sheer verticality makes this trek seem an unlikely prospect. Even the paved trails incised into the cliff faces can help only so much. What goes up still must go up. As it turns out, there is no tiki bar at the overlook, but there is Zion Canyon, and gloriously so. The Virgin River winds silently beneath monoliths. The sky is streaked by the leading edge of another storm, forecast to hit tomorrow. We’re looking forward to it, and to how the rain will transform Zion into a giant grotto, sending fog between the towers and seeps, and waterfalls down through every notch and crevice in the canyon walls. That’s one kind of perfection, and today is another. So, washed not by rain but by sunshine, we push toward the high country, through sands that alternate between pink and white, and along the margin of rock and sky, passing a view from a slick-rock ledge that looks toward the Zion Narrows and 2,000 feet down into the Temple of Sinawava. Call me romantic: I had been hoping that the Temple of Sinawava had some deeper significance, perhaps as a sacred site for the Native Americans who once ranged through the canyon. I’m heartened to discover that Sinawava is a major Paiute deity. The name, however, was actually bestowed not by the Paiute but by a Union Pacific publicity agent in 1913. I can only hope his inspiration was more spiritual than promotional. The canyon’s place-names ― Court of the Patriarchs, the Great White Throne ― are one way that people have tried to put Zion’s majesty into perspective. But there are countless hidden canyons and passages, nameless places off the tourist track, that are every bit as inspirational and, yeah ― there’s that word again ― awesome. On our last day, Tom and I head through the tunnel that leads to the park’s east side. We hike into an anonymous side canyon, where the golds of fallen cottonwood leaves jump out from the rock’s saturated reds, and water droplets left by the morning’s drizzle are strung like glass beads along a tree’s bare branches. In the narrows, we discover a series of frozen pools with faceted surfaces that shimmer like diamonds. Above them, mosses grow in a grotto where pink and orange icicles ― tinted by runoff from the sandstone cliffs ― hang down along a ledge. In its way, this Zen Zion is as stirring as that biblical waterfall was the other day: the intimate intensity of Eliot Porter compared with the grandeur of Ansel Adams. I like this guy’s spirit. And I can only imagine what he’ll say when they turn on the waterfalls again.